'The 'Rocket' of Mr Stephenson at the Museum of Science', 1922. 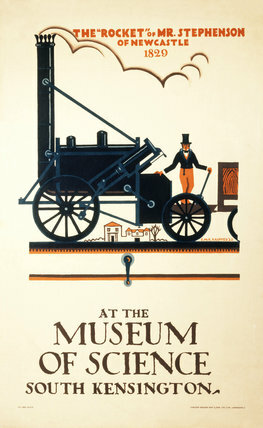 Poster advertising the Museum of Science (now the Science Museum) in South Kensington, London, showing a stylised depiction of Robert Stephenson and his locomotive, Rocket, which was an exhibit at the Museum. Built by Robert Stephenson & Co in Newcastle, Rocket won the Rainhill Trials competition of 1829, which aimed to establish which was the most efficient locomotive for railway haulage. Artwork by Edward McKnight Kauffer (1890-1954). Printed by Vincent Brooks & Son Ltd, London WC2. 'Royal Windsor', GWR poster, 1935. 'Great Western to Devon's Moors', GWR poster, 1923-1947. 'Go Great Western to Devonshire', GWR poster, 1923-1947. 'Orient Line to Australia', LMS poster, 1923-1947. 'Go Great Western to Cornwall', GWR poster, 1932.